Boxwoods are one of the most popular landscape shrubs available. They are noted for their compact forms, ease of care and adaptability. Currently, there are over 200 types of boxwoods with just over 140 of those available commercially and an unnamed number of cultivars. 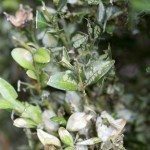 The American and English Buxus varieties are two of the most prevalent species sold in landscaping, but there are many more options for the discerning gardener. Choose from a variety of leaf shapes, growth forms and rate and hardiness ranges for a shrub that will best suit your garden. Finding the perfect ornamental plant for the garden can be a matter of taste, practicality, hardiness and maintenance level. Buxus, or boxwood, is one of the most appealing shrubs on the market with a wide range of uses in the landscape. Boxwood bush types may be used as bonsai, container plants, hedges, topiary and single specimen spectacles. Not all plants are created equal, however, and boxwoods are equally diverse and uniquely suited to different uses and site conditions. The common boxwood varieties are the most prevalent but if you choose to think outside the box, there are innumerable cultivars that might provide the right spice to your landscape with the most suitable characteristics for your region. Gardeners that tend to do most of their plant selection at big box stores will still have some stunning and affordable Buxus options. The English boxwood is heralded as an easy to grow plant with softly rounded form and lush foliage. It has an attractive loose, blousey shape that softens the landscape with easy appeal. Unfortunately, the foliage has an odor, which may be offensive to some. The common, or American Buxus has over 400 cultivars with a wide range of size, form and variation in leaf color and shape. Some cultivars can actually grow quite large, so it is important to note the cultivar’s maximum growth if using the plant in smaller locations. Other familiar boxwood bush types found in most nurseries and garden centers might be Korean and Littleleaf Buxus. If you want to have some real fun, check out some of the less frequently found boxwood species and cultivars. Upright cultivars provide architectural interest and can still withstand frequent shearing to keep the plant in a habit that suits your garden needs. These types of boxwoods make a real statement and form neat hedges for privacy and screening. Try the Buxus sempervirens series for vertical interest. ‘Dee Runk’ may grow 8 feet tall with a slender profile of only 2 ½ feet. Highlander is another upright form with rapid growth of up to 24 inches per year, a trait useful for quickly establishing landscapes. Mounding and dwarf types of boxwood are comfortable shrubs for instant greenery and fill in around perennials with practiced evergreen ease. Green Pillow is a low mounding form that gets just over a foot tall with a 3-foot spread. Grace Hendricks Phillips is a high ranking form of dwarf boxwood. Some of the larger boxwoods are perfect for screens and privacy hedges but there are also medium shrubs that have interesting texture and superior hardiness. A plant that forms an almost perfect cone shape is Pyramidalis. While not as hardy as some boxwood, it grows slowly to 5 feet with no need to shear to keep the elegant shape. Vardar Valley is disease resistant and suitable for zones 5 to 8 with a nice tight, low growth habit. Add some interesting color with Newport Blue. This plant’s blue-green foliage is an excellent foil for golden evergreens or deciduous plants. Rotunidfolia has the largest leaves of the cultivated forms. It is shade tolerant and reaches 4 to 5 feet in height. 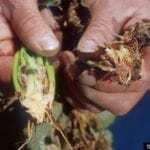 Cold region gardeners might find success with plants in the Sheridan and Glencoe hybrid class, which are hardy down to United States Department of Agriculture zone 4 with some protection. There are far too many boxwoods to list here but consult the American Boxwood Society for further information on hybrids and cultivar selections. Read more articles about Boxwoods.